Today, the marathon performances of the Running Boom champions seem almost quaint by today’s standards, as far from world class as the exploits of their own predecessors seemed during their time in the sun. At this year’s 117th Boston Marathon, five of its greatest champions from the Boom era will return to celebrate the anniversaries of their winning moments. 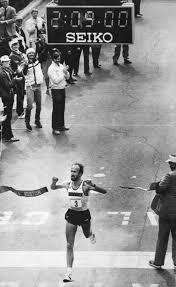 A decorated member of Les Soixante Huitards, Amby Burfoot will be celebrating the 45th anniversary of his 1968 Boston win with a small group of friends and family at 4:30 pace. In the constantly self-generating times of yore, it was Amby who brought his college roommate at Wesleyan University, Bill Rodgers, back into the running fold with his victory, just as Amby, himself, had been mentored by the previous “last American” to win Boston, John J. Kelley (1957). 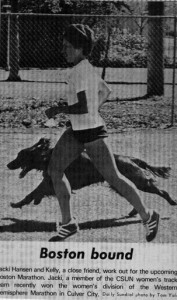 Though she only ran 3:05:59 on a hot Patriot’s Day in 1973, California’s Jacqueline Hansen would twice set the women’s world record, and notch the first sub-2:40 in history. While she won’t be running in celebration of her 40th anniversary, she will have three athletes she coaches on the starting line in her stead as she serves as official women’s race starter. 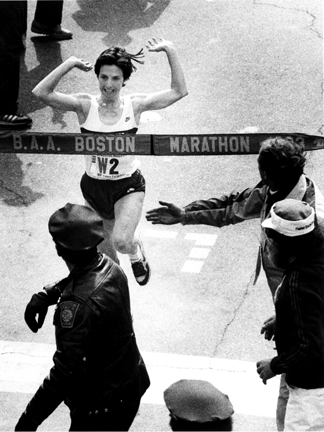 1979 & `83 women’s champion Joan Samuelson will come down from Maine to commemorate her world record 2:22:43 from 1983. That year Joanie blitzed through the half in 1:08:40s, and all this time later is still in competitive mode. 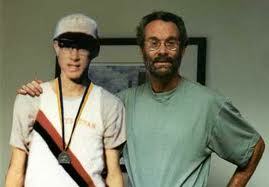 Her fellow 1983 champion Greg Meyer, now in his 30th year as ‘the last American man to win Boston’, will jog with his two sons, Jacob and Danny, trying to finish “before dinner”. Greg’s mentor and four-time men’s champion Bill Rodgers, the erstwhile King of the Roads, will be celebrating his two-second win over fast-closing Texan Jeff Wells in 1978. Bill will not run in 2013, but remains in awe of one who will. One school of thought believes it is actually bad for your health to have been a world-class athlete, that you may, in fact, strip away years due to the intensity of training. Ah, the years, like mercury they flow. From what new standards in time will 2012 Boston Marathon champions Wesley Korir and Sharon Cherop be looking back at when they return in 2042 to celebrate their own 30th anniversaries? As my running friends along with thousands of others stream toward Boston this weekend for the Monday race, I’m reblogging this wonderfully written and fitting homage to the greats of Bostons past returning this year. It’s such an inspiration to revisit their accomplishments. 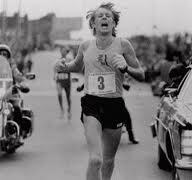 I began running the next day after witnessing this and am still running 38 years later and trying to run sub 3:30 at age 62 😉 Thanks, Bill! Wow, pretty amazing, Bill. I, too, watched that `75 Boston and got the bug. I wish I could still run. Very impressed by your longevity. Good luck. great article, my goal is to qualify for Boston. Keep trying, it’s all in the chase. The Spirit of `68 lives! You summed it up splendidly in your usual eloquent manner. I’m so pleased to share this anniversary with such good friends! There will be fun times and good laughs, I’m sure. Looking forward to seeing you there. Rodgers is so right that training and racing is more scientific today. Even for a recreational boomer runner, the information on training and nutrition is incredible and makes some of us better runners today than we were a decade or two ago. Thank you for this wonderful article featuring a group of true boomer champions. Thanks, Mary Lou. I wonder what the best of the `70s would have been able to do with the methods of today and a schedule that had only 5-6 races a year rather than 30. Your article makes me almost put on my running shoes. And would I have realized earlier that Boston is on April 15th – my birthday – I would participate! 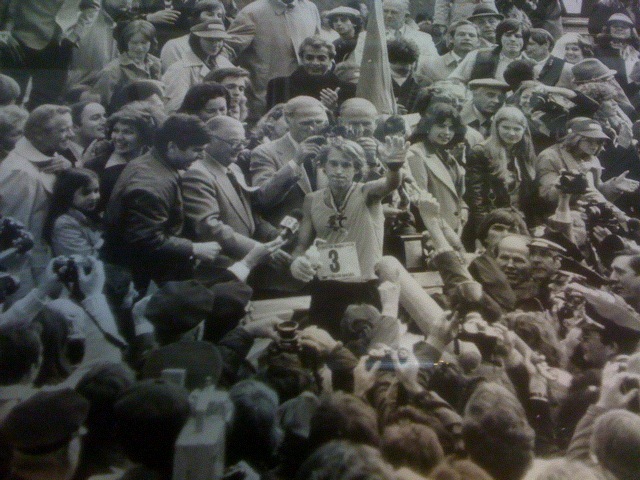 But now I will be at the starting line in Hamburg a week later. Since Boston is staged on Patriot’s Day — since 1969 celebrated on the third Monday of April rather than on the actual April 19th date — April 15th is the earliest possible date for the marathon. Good luck in Hamburg, another very nice marathon. And happy early birthday wishes. Thanks for reading. Great article, thanks! In the U.S., most of us are running recreationally with almost no chance of making any money. However, in Kenya, recreational running is almost unknown. I spoke with a Kenyan coach a few years ago who told me that if a Kenyan sees that he cant break 2:10 for a marathon, he quits simply because there is no chance of making any money. The books “More Fire” and “Train Hard, Win Easy” confirm that idea. So I doubt that Korir or Cherop will continue on after their elite days are over but I hope they do. It’s not that we might expect Wesley and Sharon to return and run in 10, 20, 25 years — I’ve seen what a few years out of training can do to a sleek, slender racer’s body. It’s more > what will be the state of the sport in another quarter century? Will the racers of 2042 be looking back at today’s times with the same quaintness that we see yesteryear?